Bryce Nelson has his roots firmly established in South Carolina. He is the Medical Director for the Division of Pediatric Endocrinology, which is responsible for the care of 1100 children with diabetes in the Upstate. Bryce was born and raised in the upstate of South Carolina, graduated from Riverside High School in Greenville, SC and went on to graduate from the University of South Carolina Honors College with a degree in Biology. Bryce then graduated from the Medical Scientist Training Program at the Medical University of South Carolina in Charleston, SC with a Doctorate of Medicine and Doctorate of Philosophy (MD/PhD). He attended Vanderbilt University for his Pediatric Residency and Pediatric Endocrinology Fellowship. He spent the last 17 years devoted to children who suffer from diabetes both by providing medical care and participating in diabetes research. His research interests have included studying mechanisms of insulin action, insulin resistance. 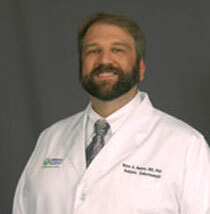 Since returning to the Upstate, he has focused his research efforts on type 1 diabetes prevention and most recently has built collaborations with Joel Williams, PhD, Associate Professor, Department of Public Health Sciences focusing understanding health care utilization and the ecological and spatial distribution of type 1 diabetes in children of South Carolina. For more information, see his Curriculum Vitae. With his new collaboration with Dr. Williams, Bryce is working to understand health care utilization and ecological spatial distribution of children with type 1 diabetes in the state. This research will be directly applied to facilitate building clinical programs in the Division of Pediatric Endocrinology to better serve this population with more robust case management that can provide real time diabetes care by integrating real time clinical data that has the potential to not only benefit this population as a whole but can be applied on a patient to patient basis. Tiger Tailgate Show, 9/12/15. Interview with Dr. Williams and Dr. Nelson discussing their research collaboration.